The door panels were also done, there was little wear on these and less discolouration, but it's especially important to get the handle clean and free of human contamination before recolouring can begin. As already mentioned, the walnut trim had been sent away to Cooper Woodtrim for refurbishment which is why they are missing in the photo above. 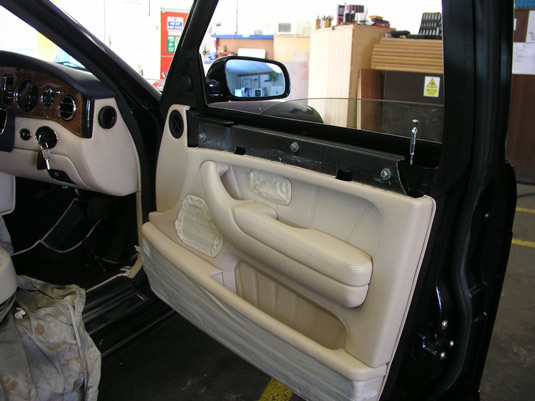 The rest of the detail was masked and the door panel recoloured with a spray gun. The steering wheel posed a new problem for us. it appears that the leather on the face had become loose and had obvious bubbles. It's quite likely that heat from direct sunlight had caused the leather to expand, and also soften the glue underneath that held it down flat. 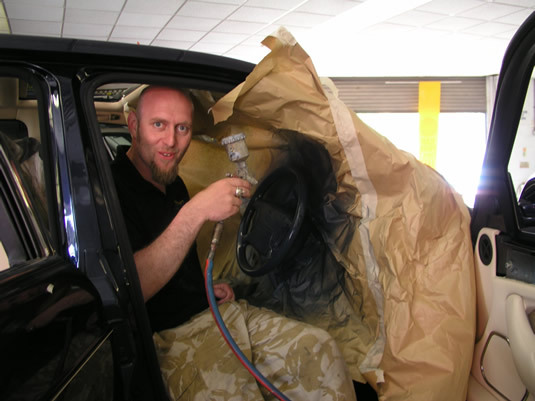 We considered sending it to a trimmer to remove the leather and glue it back in place, but this is a sealed unit containing the airbag and the explosive devices which make it work... such things are best not to tampered with. However, we know that when leather gets wet and then dries, it contracts. So we carefully made it damp and then heated it several times and luckily it shrunk back. 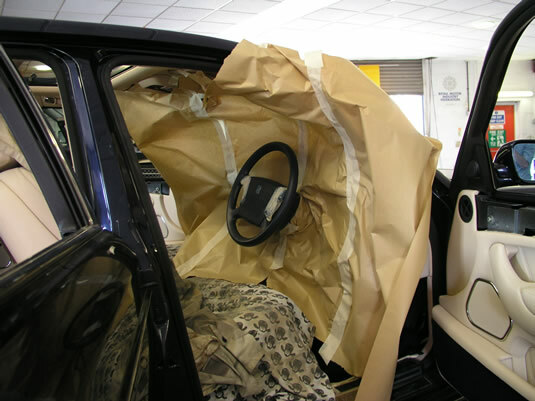 There are no guarantees that this will last, but it's certainly worth a go when you consider what it would cost for a fitted replacement unit from a dealership. Steering wheels can be really tricky. They are very high wear areas and often the colour can wear through fairly quickly and they are exposed to lots of sun and heat which makes them dry. 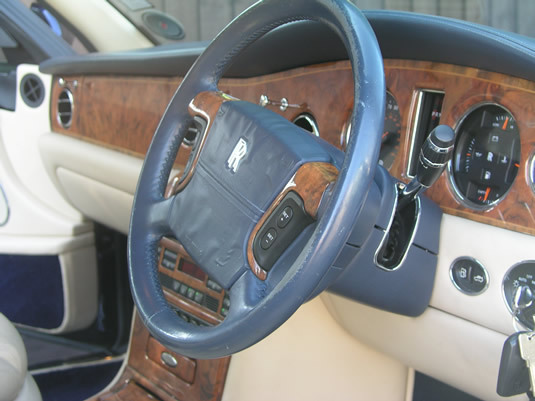 You can find that your hands are in contact with dry bare leather, the moisture from your hands along with any dirt and grime will become absorbed. This transfer tends to be acidic and will eat away at the leather. 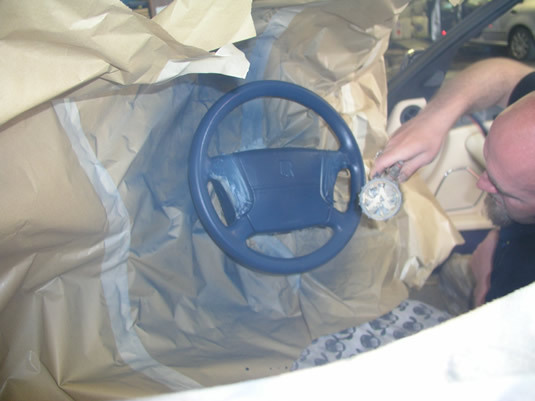 So special preparation is used when doing steering wheels, they are very carefully cleaned and keyed. Darrel repainting the steering wheel. Once again, Darrel mixed the pigments by eye to an exact match, this time using a special extra hard wearing formula. Apart from that, the process was exactly as described on the previous page. All in all, it took Darrel around 30 hours over 4 days to complete the front and partial back seats, door panels and steering wheel. Darrel himself says that it was one of the best jobs he has ever done and the results were amazing. Although we take great pains not to 'over promise' what we are capable of, this was one of those occasions where the leather came up pretty much like brand new. 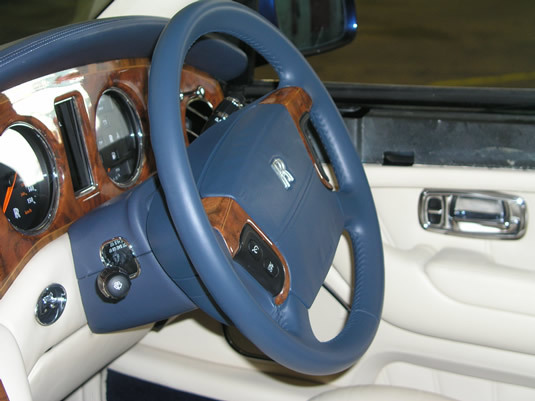 The steering wheel after completion. Leather Recolouring article using our strongest method. to be asked to work on some very rare and unusual vehicles.